Kennebunkport has a rich history. The Kennebunkport Historical Society focuses their attention year around on capturing and storing that history for our visitors to enjoy while on vacation. There are two locations and we recommend you explore both if you have time. The White Columns is a restored Victorian era home that still retains the original furnishings. This 1853 Greek Revival was home to Charles and Celia Perkins and remained in the family for 130 years. Located at the intersection with the three way stop sign on Maine and Spring Streets, it’s easy access when you are exploring Dock Square. Their ongoing “First Families” exhibit showcases more than 200 years of history in Kennebunkport from Sea Captains to our most famous residents, President George HW Bush and his family. For the 2016 season, much of the exhibit will be dedicated to campaigning over the centuries to tie in with the current election year. The White Columns is open from Memorial Day Weekend through to Columbus Day weekend, and Christmas Prelude, from 10 am to 4 pm. Admission is $10 per person, children under the age of 12 are free. They do house tours on the hour with the last one starting at 3 pm. If you take a left on North Street when leaving the 1802 House Bed and Breakfast, the Pasco Center is about a mile drive away. This second Kennebunkport Historical Site features a couple of buildings. The main building is now home to much of the items that had previously been stored in the old School House. 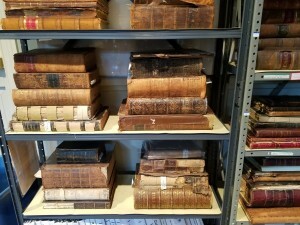 The Historical Society has spent a great deal of time cataloging and archiving several centuries of history that has been donated over the years to the museum. It’s all available to see when you visit. A couple of the shelves hold old family bibles which contain hand written notes that tell the story of the families who have lived and built the Kennebunks into what you see today. As with all history, our story is told through many different forms. Magazine articles, letters, old journals, art work and miscellaneous items are available to view here. There are things you wouldn’t expect to see. For instance, the Pulitzer Prize winning novelist Booth Tarkington was a summer resident here in Kennebunkport for many years in the the early 1900’s. He was a smoker who had his initials monogrammed on his cigarettes and shipped to him once a month from New York City. You can view one of those 1930’s cigarettes today at the Historical Society. We love the eclectic feel of this museum. 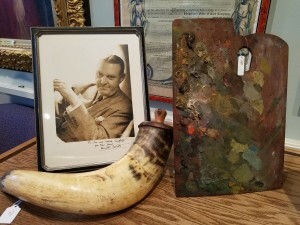 An old antler that was hollowed out and used to store powder back in the 18th century sits along side a palette from the painter Abbott Graves and a signed photo of the author Kenneth Roberts. There are many famous people who have shared their love of this Maine Coastal region in their works. For instance, Roberts used the name Arundel (now Kennebunkport) for one of his characters in his novel Rabble in Arms and Abbott Graves lived in Kennebunkport and painted local scenes from fishermen, farmers and sea captains as well as teaching painting classes in the area. His work is displayed at the Pasco Center along with many others. The Historical Society is featuring their history in a weekly posting called PortStory that gives you a peek inside the wealth of history they manage. The Pasco Center is open year around from 9am to 3pm. We hope you’ll stop in and have a look around when you are next in Kennebunkport! This entry was posted in Historic Kennebunkport, Local Information by 1802House. Bookmark the permalink.